Welcome, faithful readers (and those of you joining us for the first time) to the 117th installment of Cover Stories, the weekly column in which I, Jon B. Knutson, present a group of covers with a common theme! As promised, this week's theme is "Carnival!" although it could just as well be "State Fair," depending on the state fairs where you live! Yes, it's summertime, and all over the country at various times, there are carnivals and fairs offering you entertainment... and of course, those amusement parks that are open all year round (or at least part of the year, anyway)! 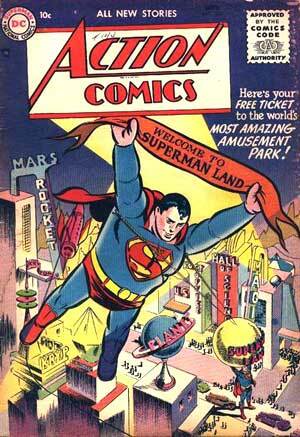 This time around, it's all DC books featuring carnival-related covers, starting with Action Comics #210, featuring "Superman Land!" Now, you may recall in the 1970s that there were plans afoot to create a real Amazing World of Superman amusement park, which sadly fell through, and all we have today to remember it is some Neal Adams concept drawings which have seen print somewhere. But this comic was years and years before that (although there are some common features... note the entrance with a Superman statue holding a globe over his head). It's too bad nothing like this has ever been done... the closest you'll find is Metropolis, Illinois, home of the annual Superman Celebration, and at least the one time I was there, there weren't any carnival rides (but it was still a heck of a lot of fun!). We can thank the artistic efforts of Wayne Boring and Stan Kaye for this look at what might have been. Inside, we have "Superman in Superman Land" by Bill Finger, Boring and Kaye, which was reprinted in 80 Page Giant #11 and Amazing World of Superman, Metropolis Edition #1. Henry Boltinoff is represented in this issue by fillers with Casey the Cop, Chief Hot Foot, and Little Pete. Also sharing this issue were Congo Bill in "The Master of the Beasts" with art by Ed Smalle, and Tommy Tomorrow in "Movie Makers From Outer Space" by Otto Binder and Jim Mooney. Oh, and there was also the text feature "Caves of Adventure" written by John Mallon. 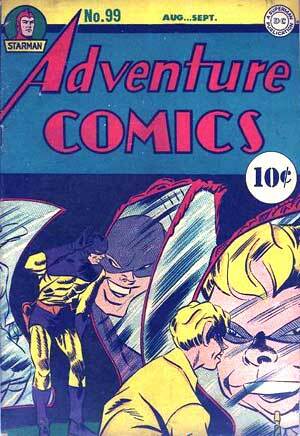 Of course, while you're at a carnival or fair, it's always fun to take in a Hall of Mirrors, and here's one now, courtesy of Adventure Comics 99! Now, I don't recall any Hall of Mirrors distorting things this much... but I'll allow for dramatic license for a Sandman and Sandy cover! The Grand Comics Database credits Gil Kane for this cover, but it sure looks like he's trying to imitate Simon & Kirby, eh? Inside, we have the Sandman in "He Doodled It" by Joe Samachson and Pen Shumaker, the Shining Knight in "New Shoes for Victory" by Samachson and Louis Cazenueve, Starman in "My Fortune for a Star" by Samachson and Emil Gerswin, Genius Jones in "Mechanical Murder" by Whitney Ellsworth and Kaye, and Mike Gibbs, Guerrilla in "Compliments of Honorable Mikado" by Samachson and Maurice Del Bourgo. 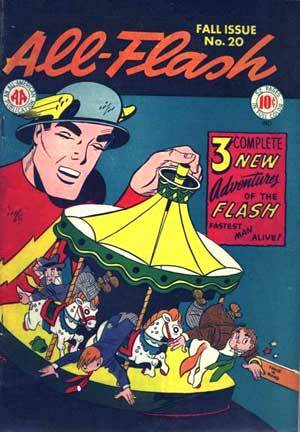 Moving down the fairway, how about a ride on the Merry-Go-Round, here powered by the Flash? Yes, it's All-Flash 20, featuring not only the Fastest Man Alive, but also his comic relief sidekicks, the Three Dimwits (whom I've referred to before as being more or less knock-offs of the Stooges, so I won't mention it again. Oh, wait, I did, didn't I?). This cover was by Martin Naydel (did you know he designed the Pillsbury Doughboy?). The GCD notes that while the All-American imprint is on the cover, M.C. Gaines' name was removed from the indicia at the last minute, leaving blank space! Inside, we have the Flash in "The Telltale Telescope" by Gardner Fox and Naydel, "The Formula for Wealth" by Fox and Naydel, and "School Days in Suburba," also by Fox and Naydel. There's also some Mutt and Jeff newspaper reprints scattered throughout by Al Smith, credited as Bud Fisher, and the text story "River Raft" by Jack Miller (writing as Jay Marr). How about something a bit more thrilling than a merry-go-round... could a Ferris Wheel be more exciting? Well, it can be if its passengers include two Jokers and soon one Batman! 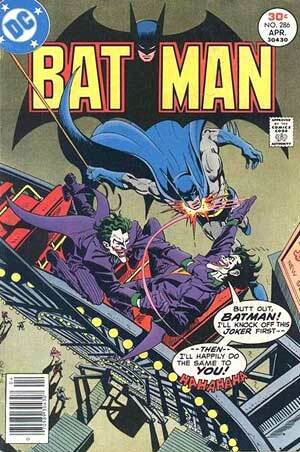 Wow, Batman 286 could've fit this category as well as "Seeing Double," couldn't it? It's fun to note that neither Joker on this cover is trying to claim they're the real Joker, as is usually the case when doubles battle... but then, the Joker is crazy enough that he'd just be happy killing the double, and worrying about who was the real one later, wouldn't he? I presume that none of you need to be told that Jim Aparo, one of my favorite Batman artists of all time, did this cover? Inside, we have the Hostess ad "That Dirty Beach" featuring Aquaman by E. Nelson Bridwell, Curt Swan and Vince Colletta, then "The Joker's Playground of Peril!" by Denny O'Neil (assisted by Julius Schwartz and E. Nelson Bridwell), Irv Novick, and Bob Wiacek. There was also a text feature by Jenette Kahn (a message from the publisher), a Mini-Puzzle (presumably by Bob Rozakis), and the letters page features a letter by Fred Hembeck! Now that we've been on a few rides, how about we try our hands at a game of chance? 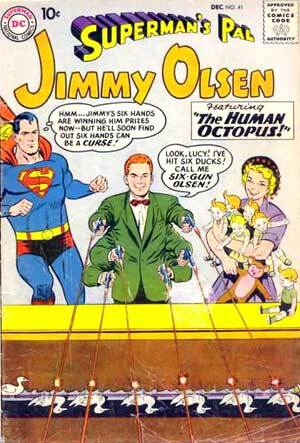 Or in the case of Jimmy Olsen, how about trying our SIX hands? Yes, Superman's Pal, Jimmy Olsen 41 features yet another one of those wacky transformations the red-headed cub reporter constantly found himself experiencing... but at least this time, not only is he enjoying it, but so is Lucy Lane! It's funny to note that Superman's thinking that Jimmy's going to regret having six hands... like we wouldn't figure that out ourselves, eh? I mean, how much does it cost to get custom-made six-sleeved green suit jackets, anyway? Since that was all Jimmy wore back then, you know he needed at least a half-dozen of them! This cover was by Curt Swan and Stan Kaye. Inside, we have "The Human Octopus!" by Robert Bernstein with art by Swan and Forte, which was reprinted in Superman's Pal, Jimmy Olsen #109, a Shorty filler by Boltinoff, "The Robot Reporter!" by Binder, Swan and Kaye, and "Jimmy Olsen, the Boy Swordsman!" by the same team, reprinted in Jimmy Olsen #108. I think this story features Jimmy being tricked into thinking he's an expert swordsman, and hilarity ensues.